I'm looking at planetesimal formation within the Orion nebula. 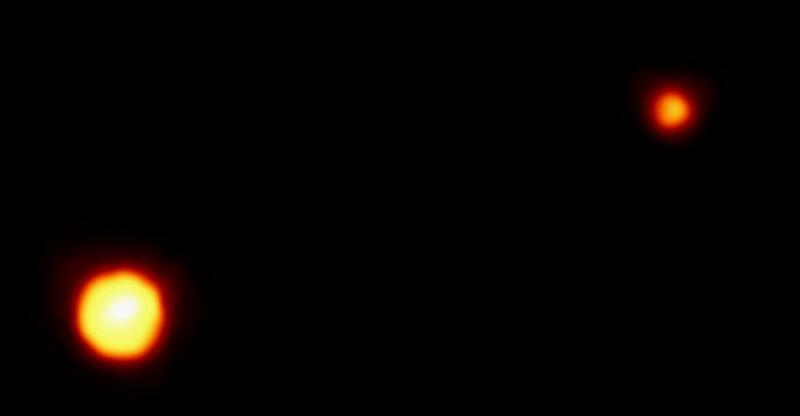 In HST images, several dozen large 'dark disks' are seen - dark only because they are blocking the light from the ionized gas of the Orion nebula region, silhouette-style. These disks may well be young solar systems in-formation -- like ours, but younger, perhaps 106 years years old. The disks are composed of gas & dust: the dust is what blocks the light, and the gas is what supplies most of their mass. The Orion region itself is visible predominantly because of the Trapezium stars, OB stars which ionize the region nearby. Besides lighting up the whole area like a flashlight, UV photons from the Trapezium are tearing apart the disk like a cosmic leaf-blower attacking a pile of sand. Models of planet formation that ignore the effect of the OB stars may be skipping a good part of the physics! Planets form by collisional growth of small particles. But, particles can be blown away from the system by the hot wind blown off from the disks. If particles grow large enough, fast enough, they're safe, but small particles can be entrained and lost by the gas. We are modeling the growth of small particles is the photoevaporated disks. We are also looking at planetesimal formation by gravitational instability -- a collective force that brings many small dust grains together. Although this method is not new, interest in it has been revitalized recently. Historically, gravitational instability is usually difficult because gas motions inhibit graisn from coming together. We are looking at methods where this can be mitigated -- for instance, if photo-evaporation removes the gas first, then gravitational instability can work subsequently. Processes in the disk are turbulent. The main source of the turbulence is escaping heat which convects through the disk's atmosphere. The heat is generated both from the initial collapse of the disk, and from turbulent viscosity generated by shear within the disk. Our model tracks the size distribution n(r,z,R,t) for particles in the disk. The particle growth process is a) collisional coagulation, and the loss processes are b) UV photosputtering, and c) removal of particles by entrainment in photoevaporating gas. We use a variable-timestep integrator to track the state vector for t ~ 106 years. 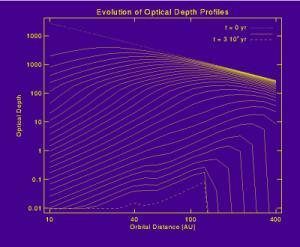 We find that, for typical input parameters, the optical depth of the disks is sharply terminated, at a distance R ~ 100 AU. Inward of this distance, particle growth is fast enough that particles are large enough (> 100 um) such that they are retained by the disk. Outward of this distance, particle growth is slower, particles remain small, and they are easily blown away by the escaping photoevaporative wind. Furthermore, grains can quickly settle to the midplane; if this happens and some gas is removed, then a gravitational instability in the remaining dust can occur. 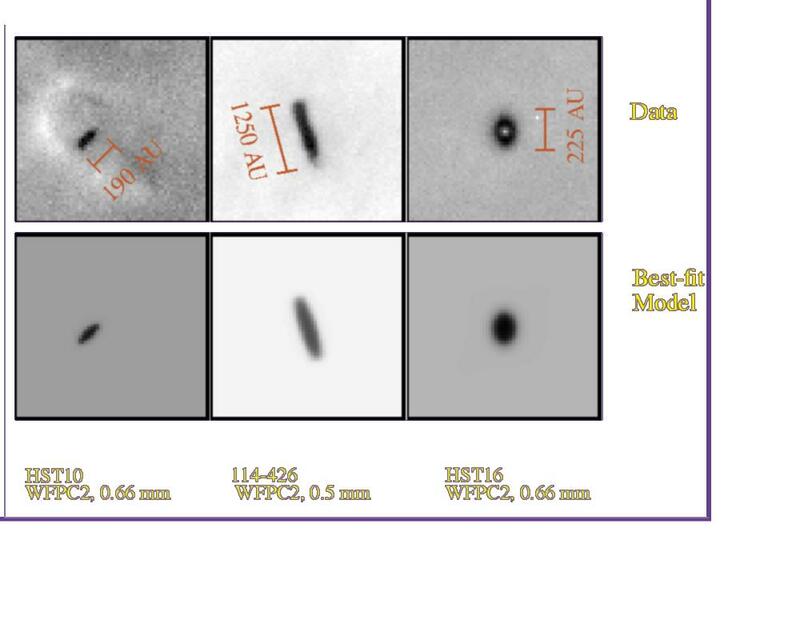 HST has been used to examine the disk images across the telescope's entire wavelength range, 0.25 .. 2.2 um. In each case, the light is generated behind the disk, photons pass through the disk, and we observe the silhouette of the disk against the bright emission nebula. The interaction between a photon and a particle is strongly dependent on their relative sizes; very small particles (r << lambda) cause blue skies & red sunsets. In the case of the proplyds, we found the disks to be not blue, not red, but completely grey across the wavelength range. This implies that the typical particle sizes are at least several times the wavelength, or > 5 um. Thus, rather than seeing individual 0.1 um grains, we're seeing aggregates, made of at least several thousand grains, which have grown in 105-6 years. 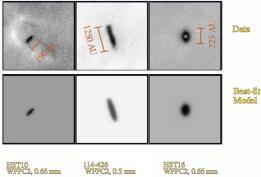 This result is the first direct observation of growth within young circumstellar disks. Our evolutionary modeling is consistent with this result: in the sharply terminated edges, small particles are swept away, but large particles remain. The presence of strong UV sources on a young disk appears to prevent the formation of large particles outward of 100 AU. Planets can't form there, because no planet-forming material there is safe from loss. Formation of jovian-type planets may be affected in the inner nebula, depending on the growth speed of jovian cores. However, jovian-type planets may be formed if they're made quickly (e.g., Alan Boss's models of gravitational collapse), or in regions where they are sheltered from photo-evaporation (e.g., far from the Trapezium core). The exact timescales are determined by a number of input parameters, some poorly determined: initial mass distributions, disk ages, projected disk distances, particle sticking probabilities, grain fractal properties, etc. I am working with the instrument & science teams for Ralph, a visible-IR imaging spectrometer onboard the New Horizons mission to Pluto (and beyond!). The spacecraft launched in January 2006 and gets to Pluto in July 2015, after a Jupiter flyby in February 2007. 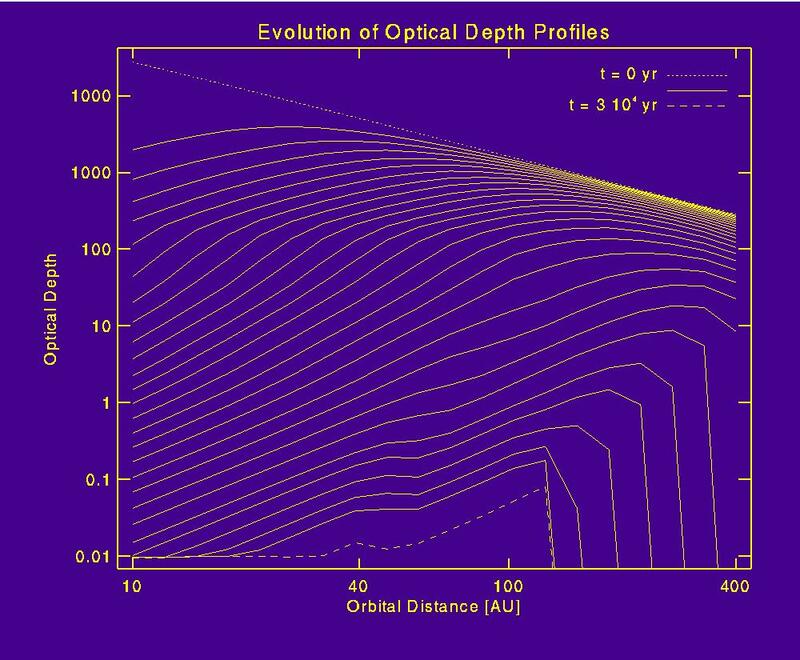 I wrote a slick web program (the New Horizons Geometry Visualizer, or just GV) which is being used by the science team to plan the encounter, and analyze a lot of the data from the Jupiter flyby. It is essentially a planetarium package, showing you what the sky looks like from New Horizons as it cruises through the Solar System. It can also be used for Cassini, Rosetta, Juno, and numerous other missions, as well as being very useful for planning observations from the Earth. When it was based at SWRI, I was associated with the Cassini ISS (Imaging Science Subsystem) instrument, which is Cassini's main visible-light camera. Among other things, I did the analysis of most of the observations of Jupiter's rings. A detailed light scattering model for realistic, icy, non-spherical particles, as applied to Voyager and HST data. We compared the present-day ring (location, optical thickness, particle size, radial profile) to end-results from a variety of origin scenarios, as predicted by the Roche-zone evolutionary model of R. Canup. We are also analyzing Galileo data of the Jovian rings, in particular for particle size distributions, to be used to compare to the output of long-term evolutionary models. We are currently working on generating accurate phase curves and spectra of the main ring, based on SSI and NIMS observations. Similar to our work with the G ring, we are able to constrain the size distributions far better by using both the spectra and phase curves than either one individually. Size-dependent particle dynamics will be calculated using the models of M. Horanyi, and formation histories constrained using the evolutionary models of R. Canup.